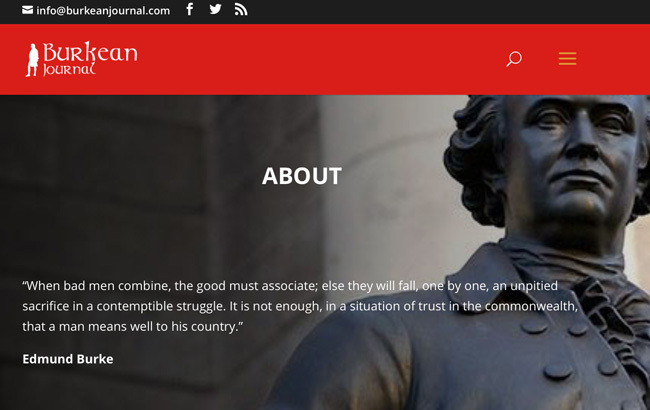 The original Burkean Journal website. The Burkean Journal is something that, for better or worse, is irreparably tied to my name, thanks in part to articles published in this very paper. Though it seems like a lifetime ago, the interview I did with The University Times was no more than a year and a half ago. As mentioned then, the idea was to create a new campus publication out of a wish to shake up College discourse and establish a balanced intellectual journal that would encourage moderate conservative values and inspire debate throughout Trinity and Ireland. This was what inspired myself and the small group of founding editors I worked alongside. The Burkean, for me, represented what could be a force for good within Ireland. It was a platform that was supposed to bring people together by broadening debate and discussion. While this was the founding aim, a little over a year and a half later, it is safe to say that the publication has undeniably failed to achieve what it set out to do. While acknowledging that politics may divide us, the Burkean existed to show that there is a multitude of different ideas that deserve respect and scrutiny independent of their ideological backgrounds. In terms of our political preferences, all four of the original editors were not homogeneous in our beliefs. The internal debates we had were interesting, challenging and reflected the diversity of opinion we hoped to portray in our output. Regardless of how the project eventually turned out, I can say I am proud to have been a part of it at this early stage. The idea of a journal in which contrasting ideas could be published together and equally challenged by all was, we thought, a noble idea, though of course, as with many good theories, the reality often proves to be a let-down. The real issue with the organisation of Burkean Journal was that there was little to none. Anyone who has ever participated in a College society committee will know this all too well. We were a handful of students trying to grapple with the pressures of College while trying to write articles, receiving copious amounts of abuse and praise simultaneously. The system of command was confused and convoluted and, from the beginning, there was issues in terms of vetos, deciding what sort of content we could and should post, and the image we were going for. We had a chain of command that, in reality, meant very little and this was to become a real difficulty, because it created tensions and, truth be told, some jealousy. Although I was technically Deputy Editor, it meant very little in the grand scheme of things. These core issues were to plague the beginning of the Burkean. Yet at the start, we were able to get past this, and still attract considerable interest. We notably managed to get respected lecturers from Yale and Emory to write for us, giving our fledgling paper a credibility boost. The aim, as mentioned, was to always try and publish opposing views, but the issue of actually managing to get people to write was difficult – the few contributors in these early days were mostly close friends and acquaintances, but still we managed to produce some good-quality content. When the time came for me to leave for Erasmus last January, I was not sure how the project would hold up, but I was still proud of what we were doing, though I certainly did not agree with everything we were posting. This, for me, was what the journal was about. The ultimate regression from the Burkean’s founding ideals could not be condensed into one single event. It was more of a steady and slow descent into mediocrity that arises when there ceases to be a diversity of opinion in the editorial board. This is an issue of many editorial boards and something we had initially sought to be the antithesis of. The departure of one of the paper’s key personalities and a consistent voice of reason just after the publication’s first Christmas was to fundamentally change the way in which the project operated and functioned. Instead of the Burkean being a centre-right bastion of varying opinions, it became much more narrow in its world view. The increasing obsession with the National Party was an initial cause for concern. One article was notably little more than an apology piece for National Party leader Justin Barrett – a figure who, to put it mildly, boasts a reprehensible political history. Ultimately, the coverage on the eighth amendment really struck me as a major failure of the paper. The issue was dealt with one-sidedly, and without even attempting to retain any sort of balance or nuance of opinion, the paper in itself became so slowly one-dimensional that it ceased to function as it was originally intended. It had transformed from a project established to find the middle ground between opinions into an echo-chamber of traditional Catholic-infused conservatism. It lost its originality and clarity of purpose. Once the initial period of the Burkean was over, and the debate around the eighth amendment began to become the only issue deemed worth talking about, it isolated the moderate readership. It became boring, it pigeonholed itself, by becoming exactly what everyone would have expected a conservative paper would be. The comments under articles stopped being from students and those seeking to argue or challenge, but the standard plethora of questionable and suspicious-looking Facebook accounts. The paper had become an echo chamber – the very thing it had always sought to challenge. The danger with an echo chamber is that when surrounded by the same opinions constantly, you lose your sense of balance. In my view, the Burkean has failed, because it no longer represents a broad strain of students who are concerned with or interested in politics. It now appears to represent the fringes of radicalism, emulating a distinctly American style of extreme conservatism. It was during my return to Ireland to vote in the eighth amendment referendum that I discovered that in my absence a new committee had taken over the paper. I tried to remain involved in the process and, on my return from Erasmus, sought to engage with the paper. And although those involved were nothing but friendly to me – it would be a lie to say otherwise – it was no longer the paper I wanted or had hoped it to be. It was no longer the paper that had four editors with vastly different opinions. It was bland. Though I never had an issue with the publication of ideas and articles I didn’t agree with, there are lines that, for obvious reasons, should never be crossed. I think we all know where they lie. It’s disappointing to see something that was established to add to intelligent College debate devolve into something no person of reasonable mind or logic could defend. The Burkean’s latest offering, “Not All Are Born Equal” reflects nothing other than pseudo-scientific racial theory, with no grounding in either facts or reality. While it may have saved the publication temporarily from total obscurity, it has ultimately and, perhaps rightfully, condemned it. Louis Hoffman was one of four founders of the Burkean Journal. Hoffman served as Deputy Editor of the publication in its first six months.